Fluttering like the wings of the majestic dragon upon it, the fiery tones of the Bhutanese flag projects against the crispy clear blue November sky. In its wavy shadow a male dressed in the traditional Gho retouches the intricately painted wall tapestries at the entrance of the grand Tashichho dzong monastery in medieval metropolis of Thimphu. With every brush stroke he refines the richness in heritage that is embedded into the Bhutanese way of life. 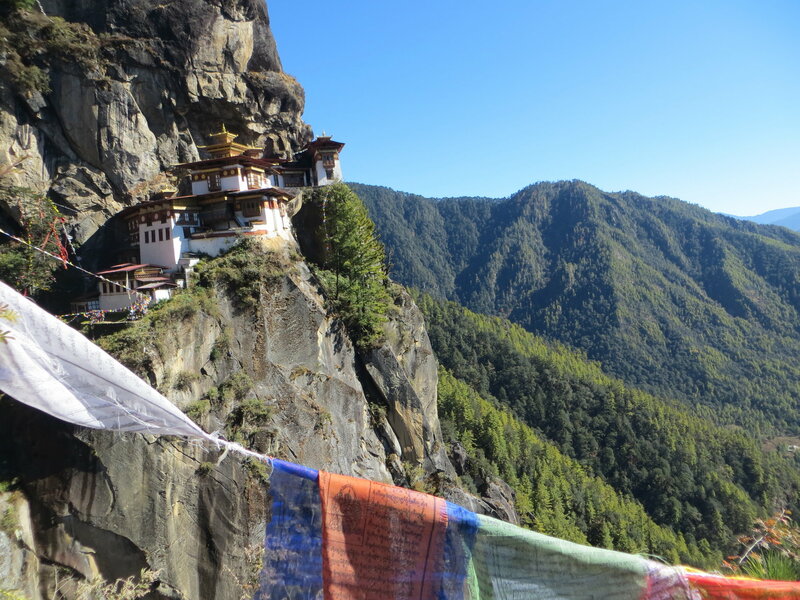 Veiled by its lofty Himalayan coating, Bhutan revels in a mystic haze of timelessness. Where a fervour for religion and culture continues to fuse effortlessly with livelihoods. To learn to value one’s own time is to discover a world where time has stood still. I gently sip the warming welcome drink, Ara, a fermented rice liquor with pieces of scrambled egg floating inside. It is warming, unfamiliar and energising all at once, like the last Himalayan kingdom before me. A large golden Buddha statue peers over the mountainside through the lines of prayer flags, protecting the capital Thimphu below. The grid-like street pattern gives way to a Chorten, a large hemispherical structure containing Buddhist relics, with its encircling worshippers, rotating prayer wheels and burning embers. Its the only capital in the world without traffic lights, shunned by the Bhutanese for being too impersonal, instead wardens guide the traffic whilst standing in street central pagoda-like structures. Through the windows of the capital’s gothic buildings at night, the transient glow of adverts upon television sets is almost non-existent. Young minds are not lost to chasing trends. Their pace of life, and appreciation of the present, derives from trending in Bhutanese values. Below a picture of their king, students in Thimpu’s Arts school redden their faces with an adept focus. They carve, weave and paint like established artists, each motion entrenching their culture and morals into every fibre of their being; into the lavish Ghos and Kiras that Bhutanese men and women wear every day, and into the majestic architecture of its Chortens and Dzongs. Gross National Happiness, the hallmark of the Bhutanese way, eschews the complexities wrought by the metamorphosis of time, and offers an affinity with land and nature, which runs unabated in its people’s blood. A melodic ebb and flow animates the vast rice plains of the Punakha valley with the rhythm of its farmers. Echoes of laughter erupt sporadically through the agricultural milieu as the residents of Ritsha village begin their day under the heat of the Himalayan sun. Behind me a herd of school children with oversized rucksacks giggle at the line of symbolic phalluses painted upon homes en route to the Chime Lhakang fertility temple. Their homes appear precarious, built from compacted mud and stone but the smiles on their faces are unwavering. I follow the Mo chu and Po chu glacial blue rivers like a royal pathway to the Punakha dzong. Its grand courtyards reverberate with the hum of Buddhist verses, and its inner temples glow with lavish decor, adorned with golden Buddhas. 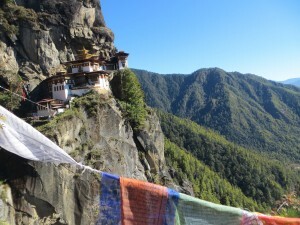 Where a tigress is believed to have transported Guru Rinpoche, the second Buddha, to Bhutan, the white washed walls of the Tiger’s Nest Monastery now stands imperiously, clutching to the mountainside. Below, the lush greens of Bhutan’s preserved landscape causes the regal structure to emanate. It is the same earthy richness that highlights the drying red chillies emerging on roof-tops, and velvet red of a trio of adolescent monks chasing each other through the courtyards of the Gangtey monastery in the Phobijkha valley. In the snappy cold at the base of the valley wilderness, the warmth of my homestay coats me. Above the wood burning stove, or bukhari, a large cauldron of bubbling water heats my western face, flushing it with realisation. As the speed of our lives increases, there is less time to savour the moments and values we hold within it. In this Himalayan abode, each image of outstanding beauty seemingly stops time; and the authenticity and simple pace of life of its people, brings me back into the present. Getting lost in time in Indonesia. I love the mention of being the only capital city without traffic lights. My mind is racing with queries as to whether it is traffic chaos or everyone drives sensibly to overcome this lack of modern traffic tools.